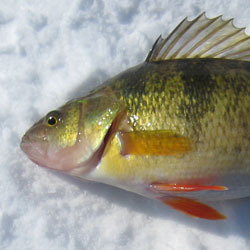 Lake Simcoe is famous for its winter fishery. One of the most popular fish anglers target during the ice fishing season is the whitefish. The Lake Simcoe whitefish are a unique strain, distinct from the whitefish populations which inhabit many of the shield lakes in Southern Ontario. The Lake Simcoe whitefish commonly attains weights of 3-5lbs, with some fish topping the scales in excess of 9lbs. Whitefish are schooling fish and generally when you catch one fish, more are usually nearby. 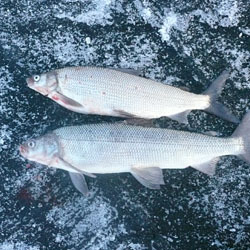 Early ice, seems to be the best time to catch whitefish in numbers, with anglers targeting well known areas such as the deeper waters around Fox and Snake Island, Long Shoal, Kempenfelt Bay and Oro Beach. Most anglers fish in depths ranging between 75-100 fow, with the majority fish being caught in 80-85 fow. 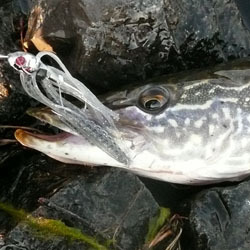 Lures of choice include various jigging spoons, like the Williams half-n-half whitefish spoons, Williams wablers and Krocodile spoons. Badd Boyz jigs, Meegs and Blue Fox Little foxee jigs tipped with live minnows or small tube baits can also be very effective, especially when the whitefish are interested in a more subtle presentation. The use of a flasher can be invaluable when determining the whitefish moods on a given day. Sometimes Lake Simcoe whitefish will be aggressive and hit spoons jigged 5 feet of bottom, other times, they will be close to bottom and a small jig, twitched inches from the bottom can trigger a strike. Don't be afraid to bounce the bottom and stir up the silt to attract whitefish to your bait. Try to imitate a dying or injured baitfish since whitefish are opportunistic feeders. Many anglers with permanent huts will chum an area for days and sometimes weeks to keep the fish in the area. Chumming with salted minnows using chum cans, is very effective at concentrating the fish under your hut. Live bait is always a good choice when targeting whitefish. 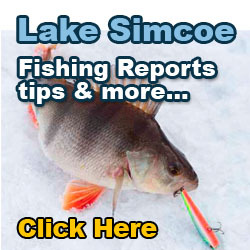 Most Lake Simcoe anglers will use a spreader rig, right on bottom, baited with small lively minnows. Sometimes adding an additional hook higher up the line, and baited with a large minnow can produce some larger whitefish and a bonus Lake Trout. 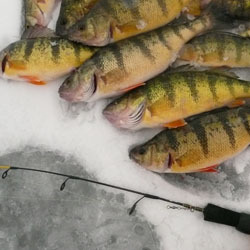 For more information read Ice Fishing Lake Simcoe. The current limit for whitefish is 2 fish per sportfishing license. Whitefish are members of the Salmon Family. The word is also used for the subfamily which also includes ciscoes and the inconnu. This member of the Salmon Family is distinguished from its relatives by having large scales, no parr marks, no teeth, forked tail fin, 2 flaps of skin between the nostrils, the mouth is under the snout, the upper jaw curves backward making the snout rounded, lower fins are clear, but sometimes with dark sports. Large whitefish develop a hump on the back, particularly in northwestern Canada. 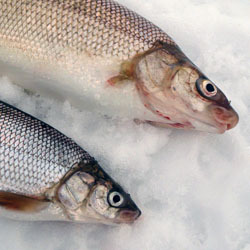 Lake whitefish produce more mucus than ciscoes and feel slipperier. A whitefishes overall color is silvery with a light to dark brown, greenish or black back and a silvery-white belly. Scales are outlined with pigment in northwestern Canada. Flanks may have a bluish-tinge. Fins vary from clear in the Great Lakes to black-tipped in the north. 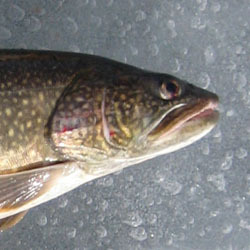 Hybrids between lake whitefish and lake cisco exist in the Great Lakes and elsewhere and are known as 'mule whitefish'. They are bright green in color and intermediate in anatomical characters. They can reach 91 cm total length and 19 kg. Lake whitefish are found appropriately enough, in lakes but are also in large rivers. They enter brackish waters of Hudson Bay and the N.W.T., and rarely in New Brunswick, feeding there during the summer months. Their depth range depends on temperature. In southern Canada they retreat to cooler, deeper waters in summer, down to at least 128 m, but in northern Canada summer temperatures are probably cool enough in surface waters. Food is various bottom invertebrates, small fishes and fish eggs although some may feed pelagically on plankton or take terrestrial insects fallen on the waters surface. Fishes eaten include Johnny darters, spottail minnows, ninespine sticklebacks, gaspereau, smelt, and deepwater sculpins. Lake whitefish are eaten by lake trout, northern pike, walleye, burbot, yellow perch and others. They also eat their own eggs. Females live longer, and mature later than males. Life span is at least 30 years and in colder lakes, even over 50 years. Maturity is attained as late as eight years in Great Slave and Great Bear lakes, but southern populations mature earlier, as early as two years of age. Spawning takes place over 2 to 6 weeks from September to January, earlier in the north than the south, when water temperatures fall below 8 C. Some spawning may occur under the ice. Northern populations may only spawn at 2-3 year intervals. The fish enter shallow waters, less than 8 m deep, and release eggs over hard, sandy, silty or weedy bottoms. Some fish can spawn in deep water. The spawning process often takes place at night with much splashing and jumping out of the water. Pairs of fish or one female and two males rise to the surface and shed eggs and milt. Each female can release up to 500,000 eggs. The eggs hatch the following spring, usually in April or May, and receive no care from the parents. Post-spawn adults move to overwintering areas, such as shoals and reefs. Populations of whitefish in different lakes vary considerably in diet, growth rate, and movement patterns. Whitefish is a very important commercial species in Canadian fresh waters although numbers are declining through overfishing, pollution and the predations by sea lampreys. Along with lake trout, this species is the principal recreational and commercial fish in northern Canada. Whitefish are marketed dressed, fresh or frozen. They may also be canned and the eggs made into 'golden' caviar. They are considered to be better eating than lake trout. Whitefish are found from New Brunswick and some Nova Scotia lakes, and Labrador west to British Columbia and throughout the Yukon and N.W.T. including Victoria Island. Also introduced into Newfoundland and parts of British Columbia and Alberta. Few people target whitefish in open water, unless they know of shoals and reefs onto which whitefish move over to feed at very specific times in the spring and summer. For those fishermen that do angle for whitefish in open water, light to medium action spinning outfits used with 6-10 lb. test line is preferred. Most whitefish are caught through the ice by fishermen using 'tip-ups' and bait, or jigging small artificial lures or bait near the bottom. Most anglers across Canada catch whitefish while fishing for lake trout, burbot and cisco in deeper water. 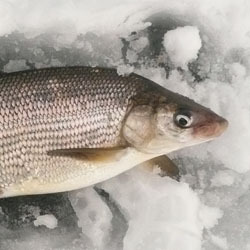 The favorite technique to catch whitefish through the ice is by using a 'spreader-bar' which is often rigged with two or three hooks that extend out on leader from a center weight. 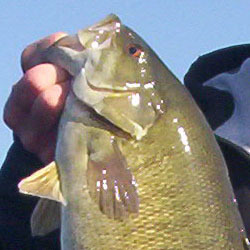 The spreader is usually fished right on the bottom, baited with live or dead minnows. On Lake Simcoe, fishing with a spreader bar has become so common, they have developed their own rig, named "The Lake Simcoe Spreader". The Lake Simcoe spreader uses stiff mono to separate the minnows instead of steel wire, since Lake Simcoe whitefish can be shy due to heavy fishing pressure. Whitefish can commonly place their mouth on top of the bait and just lay there eating it. This can make it very difficult to detect a strike. Because of this, most ice fishermen will use a 'tip-up' devise that is set-up so that it is perfectly balanced. If the whitefish tugs on the line, or gently lifts the line, it registers by the tip-up moving up or down. After ice-out, whitefish can cruise into very shallow water feeding on invertebrates. 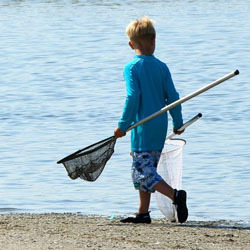 At this time of the year, fly fishermen can catch whitefish using floating lines and a variety of nymph pattern flies. During June, when mayflies hatch on many lakes, whitefish can be seen feeding on the surface, especially at dawn and dusk. This is another peak time for dry fly fishermen to target these aggressive surface feeders. Timing is critical for both types of flyfishing, and accurate casts are required to target individual feeding whitefish. 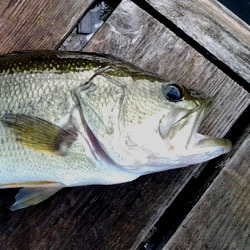 In open water, during the summer months, most anglers will fish either near the bottom using small live minnows for bait, or vertically jigging small spoons, or jigs.